This recipe was found in my new favorite vegan cookbook that you can get by clicking here!! I highly recommend this book. Every recipe I have tried is really good and she gives some great cooking tips!! 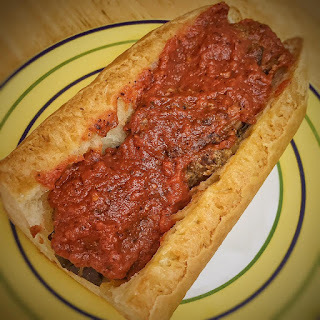 These eggplant meatball subs got almost two thumbs up and I will definitely be making the meatballs and sauce again in the near future! If you try out the recipe let me know below what you think! Enjoy! Pre-heat the oven to 400 degrees. Line a baking sheet with parchment paper. Spread the chunks of eggplant onto the baking sheet. Lightly spray the chunks with olive oil and drizzle the liquid aminos over the eggplant. Sprinkle with salt and pepper, then toss to fully coat. Roast for 20 minutes, tossing once halfway through to ensure even cooking. When they are tender and caramelized, remove from the oven and let them cool for about 5 minutes. Meanwhile, combine the amaranth and broth in a small pot and cover. Bring to a boil. then reduce the heat and crack the lid. Simmer until the liquid has cooked away, 10-15 minutes. Fluff with a fork and set aside. While the eggplant is in the oven, heat the oil in a small frying pan over medium heat for about 1 minute. Add the onion and garlic and saute until the onion is translucent. Remove from heat. Combine the eggplant, onion and garlic, nutritional yeast, basil, oregano, and liquid smoke in a food processor. Pulse just a few times until it is broken up and mushy, but still a tad chunky. Add the eggplant mixture and chickpea flour to the cooked amaranth and mix. Use a tablespoon or ice cream scoop to scoop about 2 tablespoons of the mixture into your hand. Shape into a ball and place on the same parchment-covered baking sheet you used for the eggplant chunks. Repeat until all of the mixture is used. Bake for 25-30 minutes, until the meatballs feel solid and are slightly browned on the outside. While the meatballs are baking, make the marinara sauce; Combine the tomatoes, broth, tomato paste, sriracha, and basil in a medium pot. Bring to a boil, reduce heat, and simmer for 10-15 minutes. Transfer the sauce into a blender and blend until you have a thick, chunky sauce. Add salt and pepper to taste. Carefully slice the baguette lengthwise, leaving the top and bottom connected. Spread a couple of spoonfuls of marinara sauce on the bottom half of the sandwich. Add 3-4 meatballs and spoon a few spoonfuls of sauce over them. The messier the better! Serve and Enjoy!